DTR (deep tissue repair) therapy is a highly effective treatment for knee bursitis. Medical Treatments Once Reserved For Pro Athletes Are Now Available To The Public... Now You Can Heal Yourself At Home! Decreased Inflammation in their Knee quickly. Decreased their Chance of Re-Injury by Healing More Completely & Quickly (less scar tissue). Decreased their Chance of Re-Injury by Learning About What Caused the Injury in the First Place. ...they simply decided to try our home treatment recommendations and committed themselves to a daily treatment protocol. But before you decide on a knee treatment path, an understanding of the three major stages of the healing process is critical. With the right knowledge and the right treatment options, you can accelerate your recovery without the fear of re-injury or setbacks (which unfortunately, happens to many people - we will explain why further down the page). Inflammation is the body's natural response to a shoulder injury and is a normal part of the healing process - helping to reduce tissue infection in the early stages of injury. Swelling, pain, heat sensation, redness, and loss of function are the main symptoms experienced and it is your bodys way of telling you there is something wrong. For certain soft tissue injuries of the knee, there may be no other option than surgery. As an example, if you have a full tear (often termed as "avulsion") of a ligament, tendon or muscle - attachment surgery will be required to sew them back together; in some cases, graft surgery (moving soft tissue from one site to another) is utilized when reattachment success is improbable. The overwhelming majority of soft tissue injuries of the knee, however, are not surgically necessary and in such cases your physician will almost certainly recommend conservative treatments options. The combination of rest, elevation, topical pain relief cream and the use of a Cold Compress or Ice Pack (when there is swelling) is the gold standard in medicine for minimizing tissue damage and reducing inflammation after injury or activity. It serves as a critical bridge into the next phase of the healing process. There are certain cases where inflammation is very minor or even non-existent. This behavior is often found in tendinosis and osteoarthritis injuries. If there is no swelling, then there is little need for cold therapy - and as such, treatment should proceed directly to step 2. Tendons,ligaments, cartilage, and some muscle fibres are considered dense tissues. As a result, they naturally receive limited blood flow and this is precisely why injuries to these tissues take so long to heal. The challenge is, how do you effectively increase blood flow to these tissues in the knee? It is through the blood the body carries the nutrients, oxygen, and antibodies the injured tissues need to repair and rebuild. Research shows that electromagnetic energy is a very effective treatment for stimulating blood flow to dense tissues such as tendons, ligaments, muscles, and even portions of cartilage. This dramatically improves the healing process. When you have a muscle, tendon, ligament or bursa injury, there is reduced blood flow to the injury site - inflammation and reduced movement (lack of activity or on-going immobility) will reduce the flow of blood - and if you think about it, this makes sense. If you are moving your injured knee, you run a risk of increasing the severity of the injury which is not good at all. If there has been some healing, you could re-injure this soft tissue all over again, quite possibly making it worse. Electromagnetic energy is an energy waveform that is absorbed by dense tissue (muscles, tendons, ligaments) and absorbed much less by low density tissue (fat cells, skin). Absorption of this energy translates to heat, and the body increases blood flow to the area as a response to the heat. This increased blood flow speeds up the healing process, clearing the area of toxins and excess fluid build up, thereby reducing inflammation. This process is simply known as DTR Therapy, and stands for Deep Tissue Regeneration Therapy. This is a very important tool for complete and fast healing! With dedication, the right tools, and the right information - you will achieve your goal of a sustainable recovery. A combination approach of cold compression therapy, deep heat treatments, and functional movements will make it happen much more quickly. In our experience, soft tissue repair rates via conservative home treatment methods using a dedicated, comprehensive approach have surprised many of our clients, but will differ from person to person. In nearly all cases, however, it is very important to stop whatever you were doing that created the injury in the first place (ie. running, cycling). Are you looking for a superior level of treatment for your injured knee or chronic knee pain? There are highly effective treatments for knee injuries that you probably do not know about. A great number of our clients have achieved their goal of overcoming a debilitating knee injury and have returned back to their regular activities sooner than expected by treating themselves at home. For years, professional athletes (and privileged individuals) have had access to state of the art treatment therapies that allow them to heal more quickly and more completely than you or I. This is why athletes that have a serious knee injury can often get back in the game in a matter weeks, while you could suffer for months or even years (in chronic cases). Fortunately, with some of breakthrough products we have engineered, professional treatment is now available to anyone who needs it. Knee tendinitis, knee strain, partial knee tears (ACL, MCL or PCL), runner's knee or a knee hyperextension can happen to anyone, not just professional athletes. Right now, there are thousands of doctors and physical therapists dealing with patients that require a solution to treat their injury fast and heal it (where possible). Maybe they are competitive golfers or football players that must return to their sport quickly (downtime=money), or perhaps they are just patients that are unwilling to just take pain pills, lay in bed and wait. Regardless of who you are or your reasons, if you want to be proactive about properly addressing your injured knee, read more about augmenting your treatment with MendMyKnee's system utilizing DTR Therapy. We have many happy customers that have healed their knee injury faster than they expected as well as significantly reduced their pain during treatment. Anyone can injure their knee badly, not just professional athletes. Knee injuries are very common and are often a result of a quick twist or a blow to the knee or overuse of the knee joint. Stretching or tearing of the anterior cruciate ligament (ACL) or the medial collateral ligament (MCL), tearing of the meniscus, tendinitis in the patellar tendon or quadriceps tendon, and Hoffa's Syndrome are all frequent knee injuries. Regardless of the type of soft tissue that is damaged, it is painful and your knee can feel very unstable. Knee injuries can persist for years and be disruptive to your way of life. Recovery can take a long time but proper healing is essential to regain strength and get you back to the activities you enjoy. Constant re-injury needs to be avoided at all costs! It seems like an obvious statement, but I really need to drive this point home. Re-injury of the knee is very common... why? Everyone wants to get back to their regular lifestyle once the pain has reduced. Here is where you have to be careful - often, much of the pain is due to inflammation - so, once you iced the area and the swelling dropped, a lot of the pain probably disappeared too. So then you start back at your regular lifestyle and then all of a sudden the old injury starts flaring up again - this is re-injury! Each time you flex your knee, ligaments, tendons and muscle tissue move; when they are inflamed, every movement hurts. Once tissue is injured, pain happens - sometimes a LOT of pain, so you try not to move it; when walking, this is why you limp and usually start straining the other knee. A couple days later after some rest on the sofa and a set of crutches, the pain has really gone down (as well as the swelling) and this is where most trouble will start! The pain disappeared with the swelling but you still aren't fully healed. Not knowing this, we start using our knee normally again and so we prevent the knee from healing completely, usually re-injuring it again. We continually re-injure the area through our daily activities which can often lead to knee replacement surgery later in life or strain injuries cropping up in the other knee or hip area. Scar tissue is a weak form of collagen - hard, inflexible, and tough to get rid of once it begins to take hold. The more scar tissue that develops, the more you lose the range of motion in your knee. With excess scar tissue build up, the injured tissues and the knee in general will remain weak and very prone to re-straining and re-tearing. The more scar tissue that develops, the greater the risk of winding up permanently injured with chronic pain or arthritis. Scar tissue means that your knee will not perform as well as it once did and it makes it much more prone to injury later on. The longer the injury remains, the risk of atrophy increases and the risk of more scar tissue increases. This is why it is critical to treat your knee injury now rather than later. Continuous re-injury and build-up of scar tissue makes it more likely that you will wind up with chronic pain, reduced Range of Motion or even arthritis (permanent damage). Recovery from a knee injury can take a long time, especially when some of the less effective, traditional methods are utilized. This is simply because many treatments either focus on masking of pain or are too inconsistent to provide sustainable improvement. The issue some of our clients find with cortisone injections is that people get a false sense that their injury is healed because they are not experiencing the pain they once did. Often, these clients engage in activities their doctor specifically told them not to do because they "no longer feel pain". Once the effects of the cortisone wear off in a few days or a week, people often find they have done more damage to their knee. This of course, results in a prolonged recovery. While we tout the benefits of physical therapy and believe it to be an integral recovery tool for most sufferers of knee injuries, the problem is that people only attend sessions a few times a week. To truly provide a long term solution to your knee injury, you need to be receiving multiple treatments on a daily basis. Not just any type of treatments, but ones that focus on generation of new healthy tissue - along with proper synthesis of that tissue as well. Treatments for soft tissue injuries are cumulative in nature...meaning the more the treatments are administered, the faster the benefits can be experienced. The focus on cold therapy treatments should be in the earliest stages of an injury. In the mid and latter stages of a soft tissue injury, cold therapy is used intermittently to deal with flareups of swelling and inflammation. The truth is, there will always some mild inflammation associated with tissue injuries. However, that inflammation will always remain UNTIL you begin to focus on healing the tissue. Once the tissues begin to heal, the inflammation will then subside more permanently - not just temporarily (as is often the case with cold therapy treatments on chronic soft tissue injuries). If you've been living with the agony of a knee injury for some time now, it's almost a sure thing that you're feeling discouraged, tired, and worn-out. Seemingly simple chores are now impossible - like climbing stairs, getting off the sofa without help, getting into a car or even standing for significant periods of time. The constant pain has no doubt interrupted your sleep, just adding to the long-term misery that this condition can bring on. It's just not possible to stop life's activities for weeks/months to rest knee injury unless maybe you are lying in a hospital bed where nurses can attend to your every need. What ends up happening is we continually re-injure the knee through our daily activities - further setting back our recovery. Each time the knee is placed under stress, the chance of tissue breakdown is increased and the growth of more scar tissue is more probable. This is how a knee injury can start a long term downward spiral that could end with a chronic bad knee, atrophy or even knee replacement surgery. Long Term Knee Injuries Not Only Affect the Knee - They Will Lead to Other Conditions and Injuries. When moving an injured knee - especially if its swollen - you will feel quite a bit of pain... basically every movement hurts. Due to this pain, your body will subconciously try to minimize knee movement. This means that when you are doing something you normally would use your injured knee for (getting dressed, walking, climbing into a car, gardening), your body will automatically start using back, hips and ankles and opposite knee instead. If you have a knee injury on the right side (knee injuries most often occur on the dominant leg) then your body will start using the left knee a lot more - even though it is inconvenient. A couple days later (after purposefully avoiding movement of the right knee), the pain has gone down (as well as the swelling) and this is where the trouble begins. Curiously, your hip and left knee are starting to hurt - this is because you they are bearing more of the load! The right knee pain disappeared with the swelling but it is still isn't fully healed. Not knowing this, your start using your knees normally again and then the injury swells up again like it did before - all because the injury wasn't fully healed in the first place. Eventually, we use the other joints more and more and this is why the opposite knee (and hips) start to continually ache and hurt - they are being overused now - they really cannot handle the increase in loads that the injured knee once handled. Soon, aches and pain can become commonplace in the lower body and back - all as a result of the original knee injury and the body's instinctive nature to "protect" it - all because the injury wasn't fully healed in the first place! We continually re-injure the knee through our daily activities and now this injury has become a chronic knee injury. An injury to one knee area can easily lead to straining in other areas, making an overall recovery hard to initiate. For example, a serious muscle strain in the right side knee will typically lead to over-straining of the left knee. Most commonly, the injury occurs on the dominant side, so the risk of straining the other (weaker) side increases. The longer the injury (and corresponding pain) persists, the greater the chance that you will sustain more strain from overcompensation, eventually leading to issues in those areas as well. To minimize potential secondary injuries, know that it is important to deal with your injury quickly and completely. Truly, knee injuries can become a vicious cycle - which is why it is absolutely critical to focus on healing methods designed to rebuild and strengthen the injured tissues in a timely manner. The faster you truly heal, the less chance you have of sinking into a downward spiral of re-injury, scar tissue growth and overcompensation injuries. So I Think I Have a Knee Injury - What Should I Do Now? If you suspect you may have a knee injury, the first thing to do is consult your physician; only your physician can give you a proper diagnosis and from this, determine a course of proper treatment. After seeking medical advice, your physician will almost always recommend conservative treatment options - conservative treatment options for a knee injury typically means rest, ice the injury, elevation of the injury and take anti-inflammatory medication. (reference: 1, 2, 3). Stage 1: If the knee injury is very recent - use a good quality cold pack and Arnica Pain Relief Cream. If the injury has been going on for awhile, then skip to Stage 2 below. 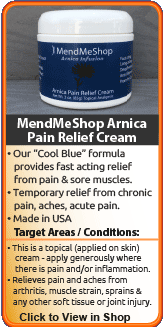 Recommendation 1: If you are experiencing pain and swelling in the very early stages of the injury (first 48 to 72 hours), the first step in a conservative treatment protocol would be to focus on reducing the discomfort by applying a quality cold pack to the injured knee along with a high quality pain relief cream such as our Arnica Infusion Cream. The real challenge is how do you promote blood flow to the knee injury site without causing further injury? This goal is further complicated by the fact the knee (and muscles controlling the knee joint) are involved in the majority of the physical movements we perform each day. Back, upper leg and knee pain can be interconnected and are often experienced in conjunction with one another. Many of the muscles that surround the knees are connected to muscles in the hip and heel which can easily lead to straining in these areas of the body as well. An injury that often leads to straining in other areas will make an overall recovery hard to initiate. People tend to "chase the pain", meaning they only focus on treating an area that is actively painful, while not taking into account the fact they other areas of the body will be overcompensating...eventually leading to issues in those areas as well. Warming the skin (conductive heat) is a poor method of stimulating heat in deep soft tissue. Electromagnetic energy is a form of energy will easily penetrate through clothing, skin, and fatty tissues... directly into your injured muscles and soft tissues within the knee. After the energy absorbs into the knee and surrounding area, the metabolic response then kick starts the repair and rebuilding process. Research is continuing and soon, much of North America will know what the Far East and Europe has known for a long time; electromagnetic energy provides a wide range of health benefits for those not only suffering from hip strain, but for many other ailments (tendinosis, bursitis, tendinitis, Tenosynovitis, hip tendinopathy, muscle tears, hip replacement post surgery, frozen shoulder, knee achilles tear/strains, rotator injury, sciatica, tennis elbow, etc.) as well. 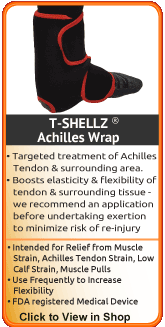 The best option we came across in our research to accomplish true healing of soft tissue knee injuries is the Knee T•Shellz Wrap®. Use of this device results in a dramatic increase in blood flow to the injured tissues located deeper within the body - all in a non-invasive manner. Have you seen what happens when you add water to a flower wilted from drought? In essence, your injured knee is much like a "wilted" flower; your body wants to heal its injury, but needs lots of nutrients to do it. Blood brings new life to your cells by delivering healing nutrients and oxygen that are vital to your tissue. In addition, the blood carries away toxins and cellular waste cleaning the area and healing it faster. Without a good supply of blood, your knee simply won't heal properly. Using the T-Shell Wrap is truly a unique experience. Within moments of applying a treatment to your knee, you can feel the healing sensation due to the increase in blood flow deep within the area. During a treatment, and for quite some time after you finish, the treated area will feel relaxed and less painful. It's a very soothing sensation and extremely effective. If you have injured your knee joint or other soft tissue in your knee, then the T•Shellz Wrap® will provide the all-important deep tissue heat that will, in turn aid in boosting blood circulation where it is needed most. If you are dealing with conditions affecting your range of motion such as an impingement or even arthritis. If you are suffering from bursitis in your knee and want to treat the major source of it (secondary damage to the muscle and tendon surrounding the bursa sac). Through overuse or degenerative changes in the knee, the muscle and tendons surrounding the bursa sacs will tighten and constrict. When they do, they place pressure on the bursa, causing it to become irritated. Applying a soothing and deep penetrating energy to the knee relaxes muscles, ligaments and tendons - taking pressure off the bursa. T•Shellz Wraps contain a unique, flexible Carbon Fiber Energy Pad which is flexible and will shape to conform to your body. This Energy Pad emits a uniform wave of perfectly safe electromagnetic energy over its entire surface. This energy travels deep inside to muscles, ligaments, tendons and the knee joint, inducing deep heat. Deep heat stimulates blood circulation your body needs to accelerate the healing of your injury. It is the electromagnetic energy that is crucial to the healing process. Attempting to treat all of these factors can become costly as different areas of the body often require different modalities in order to properly treat them...that is, prior to the development of the Knee T•Shellz Wrap®. 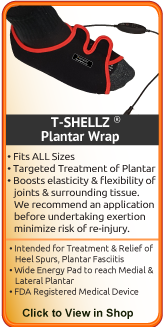 The T•Shellz Wrap® was designed with flexibility and versatility in mind to allow anyone to treat multiple areas of the body, for a wide variety of ailments. Electromagnetic energy, the technology the T•Shellz Wrap® is based on, has been shown to reduce pain sensation by direct action on the sciatic nerve - slowing the velocity of pain signals that travel up and down the nerve. In addition, electromagnetic energy applied to muscles and soft tissue that surround the sciatic nerve will help them become more loose, alleviating the tightness which usually leads to nerve compression and the subsequent pain it produces. Osteoarthritis in the knee occurs when cartilage and meniscii degenerate. Over time, the base of the femur (upper leg bone) rubs against the tibia (lower leg bone) with little or no protection from the cartilage. This lead to pain in the knee joint. The space within the joint starts to decrease without the cushioning and stiffness in the knee becomes a problem. 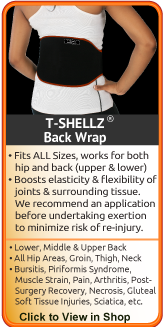 The T•Shellz Wrap® excels at emitting a soothing energy deep into the joint, allowing for less stiffness and better range-of-motion. Overall, you will get the benefits of a stronger immune system and a faster ability to heal knee muscle and soft tissue injuries such as sprains, strains, and tissue tears. 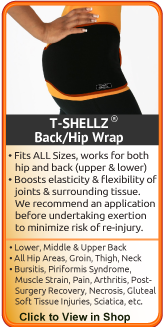 Use the T•Shellz Wrap® before activity to prevent further injury, before bed to prevent tightness from setting in during the night, and again in the morning to make your tired body come alive. The Knee T•Shellz Wrap® is an FDA Registered Medical Device and is suitable for use in therapeutic clinics and FROM HOME. It is completely safe for people and patients to use for themselves. The most common question we receive from individuals prior to purchasing is - how many times a day should I be using my knee wrap and when should I be using them? While treatment plans will differ for each individual and their specific injury, there are general guidelines that should be adhered to. An Exercise & Stretching Plan to prevent muscle atrophy and shortened tendons. A proper plan will increase elasticity and strengthen muscles, ligaments & tendons of the knee. If surgical intervention is required, you will find we have effective solutions for inflammation reduction before and after surgery. Reduction of inflammation reduces pain, enhances range of motion and minimizes scar tissue growth. You can read more about effective options for pre/post knee surgery here. Time is Money. A common phrase that is especially true when you are suffering from a debilitating injury! Rapid recovery will not happen by itself; if you need rapid recovery and complete healing then we advise you speak with your physician about whether the T•Shellz Wrap® is a therapy you could use for assisting in your conservative treatment at home. Blood circulation is stimulated in the knee area (via the T•Shellz Wrap®), and this increased blood flow flushes toxins from the injury site and brings more nutrients to the area, allowing the injury to repair itself more quickly. 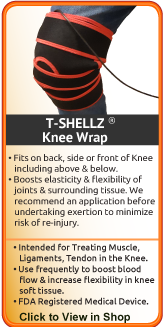 The T•Shellz Wrap® is a highly effective therapy tool for patients recovering from a knee injury. This wrap will aid in the recovery stage of healing and help prevent re-injury or tendon/muscle strain in the weakened joint. 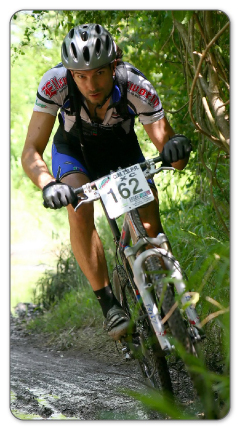 Without the risk of re-injury, most patients can and will recover from their injuries at an advanced rapid rate. A knee joint injury is a race against time. The faster and stronger you heal your knee, the less chance there is for re-injury or knee problems later on. Would you know you injured yourself if there was no pain? Probably not! Pain and swelling perform a useful role in letting you know that you did, in fact, injure yourself. Pain and swelling are what get you to seek out medical attention in the hopes of finding a way to reduce the pain and heal your injury. Inflamed soft tissue in the knee can cause extreme pain and reduce your ability to move. When you try and move your knee when swollen, you run a very high risk of injuring it further. This is why you need cold right after the injury - it gets the swelling down. You don't need medication, drugging your whole body, to mask the pain. You need to reduce the inflammation in your knee and avoid re-injury to see a reduction in pain. Just remember that an injury is not healed just because the swelling is gone - this is why you need to keep treating the injury with DTR Therapy and begin mild stretches outlined in our Ebooks once your physician gives the thumbs up. When used in combination, these modalities provide the necessary treatments to reduce the pain of your injured knee, greatly enhance blood flow to the injury and allow you to maintain and even improve the strength & elasticity of soft tissue in your knee joint. If you have a meniscus injury, knee injury or chronic pain in the knee, you can heal quickly if you treat your injury correctly. That means talking with your physician about using the right therapies every single day. 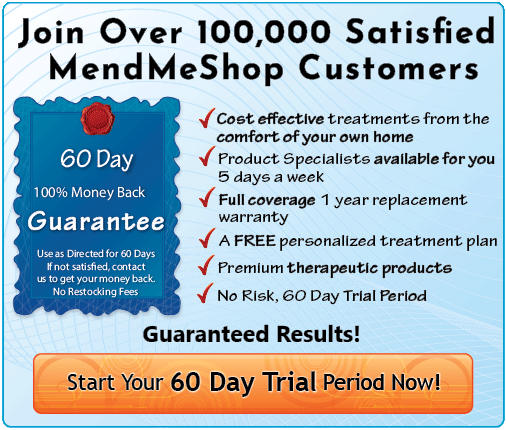 I will now explain to you exactly why these therapies are critical for properly addressing a meniscus injury. Learning about this therapy system is essential. Once you have read more, you will understand that we have the unique ability to provide you with the best treatment options available to you at home. In fact, EM Energy products like ours are currently being used in many doctors and therapist clinics - they are just that good! 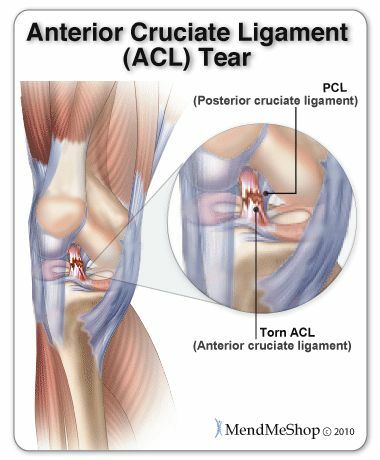 Anterior Cruciate Ligament Strain, Partial Tear or Post Surgical Recovery. Meniscus Injuries - all forms. 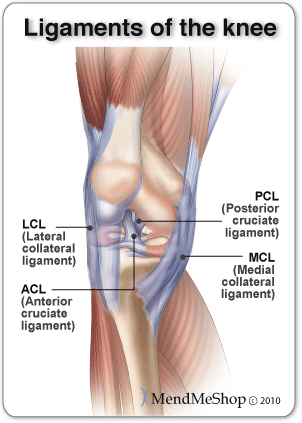 Medial Collateral Ligament Strain, Partial Tear or Post Surgical Recovery. 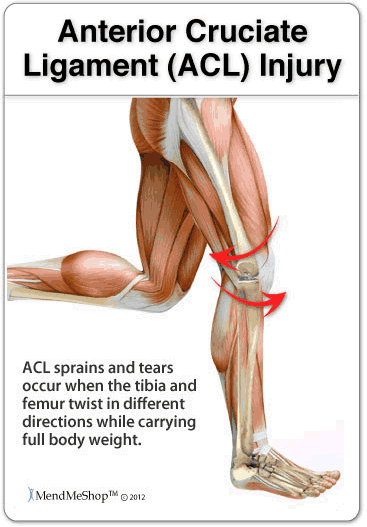 Lateral Collateral Ligament Strain, Partial Tear or Post Surgical Recovery. Posterior Cruciate Ligament Strain, Partial Tear or Post Surgical Recovery. General Knee Strain or Inflammation Due to Hyper-extension. Knee Replacement Post Surgical Recovery. 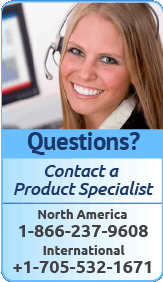 Chronic Knee Pain and Knee Osteoarthritis Pain Symptoms. If you have a bad knee injury or chronic condition, you will benefit greatly by treating your injury correctly. That means using the right therapies every single day. BEFORE exercise, workouts or activity of any kind to increase elasticity of the ligament and decrease chance of re-injury. AFTER surgery (once the skin wound has healed over) to increase post-surgery healing rate and minimize soft tissue growth at the surgery location. If you have undergone knee surgery and are looking for rehabilitation information, click here. Increasing flexibility and strength in the knee is a key component to speed healing and avoid re-injury. For this reason, we have created ebooks that outline specific knee exercises / stretches for our clients undergoing knee injury recovery. Even when you're injured and in pain you need to keep moving to break-up scar tissue that's forming in your tendons and ligaments in your knee. Regular movement can increase healthy range of motion (ROM) of your knee, guaranteeing you a speedier recovery process and return to regular activities. Moving when you're injured is hard. Since moving while injured can be painful most people think it's better to stop moving, rest their knee and hope that their knee injury will heal all on its' own. Even though rest is important to recovery, too much rest during the recovery process will increase the amount of scar tissue in your knee. DTR Therapy knee treatments combined with a proper knee stretching regimen will help decrease scar tissue growth while increasing elasticity and strength in the knee joint. During the healing process your body will fill in soft tissue tears with dense, brittle tissue called "scar tissue". The human body will use scar tissue as a temporary solution and will try to build the scar tissue as fast as possible to heal tears in the soft tissue. Scar tissue can form fast to bring together the edges of a tear, but working fast doesn't mean that the job's done right. When scar tissue forms it doesn't come together as neatly as regular (healthy) tendon/ligament tissue would. Scar tissue fibers will lay down over top of your tear in a cluttered, messy and jumbled up way. Knee Joint Atrophy in the knee is arguably a bigger issue than scar tissue. Whether you have a knee injury or have recently had a knee operation, you will find that the joint has a more limited range of motion than you had before. In most cases, this is due to atrophy - the shortening of connective tissue in the knee due to inactivity. In cases where atrophy exists, it is very important to stretch and do gentle exercise to nip this problem in the bud before it becomes a chronic (long-lasting) issue. If you are currently recovering from a knee injury speak with your physician about stretches and exercise. When done properly under recommendation of a physician, knee stretches have a proven track record of assisting in the speedy recovery of many patients. This is without doubt, the third and final essential tool for complete knee injury recovery. Once a patient deals with the swelling and inflammation through use of a Cold Compress or Ice Pack, then begins the DTR Therapy process by using home treatments with the Knee TShellz Wrap, all the while keeping rested to keep stress off the injury. Once the injury has healed, it is time to take the third and final step to recovery by beginning a knee rehabilitation stretching regimen. The Knee T•Shellz Wrap® is a highly effective therapy tool for people suffering from soft tissue knee injuries - such as strains, sprains or partial tears in muscle, tendon or other soft tissue, Tendonitis, tendinopathy, tendinosis, impingements, instability, bursitis, pain associated with trigger points, scar tissue, and arthritis. A huge number of people who contact us about knee pain haven't a clue about the true causes of their discomfort. It is an amazing statistic and really goes to show how important it is to get a proper diagnosis from your physician. To really deal with a injury, you have to know the injury is - so get to the doctor and find out what the issue is. The truth is, knee pain is usually a culmination of numerous factors, which include repetitive stress, short leg syndrome, poor running gait, and overcompensation issues resulting from other muscle and soft tissue ailments. But what I can say is this...we have helped tens of thousands of patients in the past twelve years. During this time, our refund rate has been astonishingly low. You will not be left in the dark after purchasing any product from us. 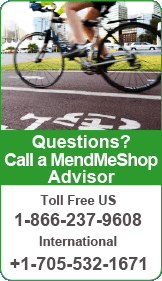 MendMyKnee Advisors and Product Specialists are available 9:00 am to 10:00 pm Eastern Standard Time Monday, Tuesday and between 9:00 am and 5:00pm on Wednesday to Friday. 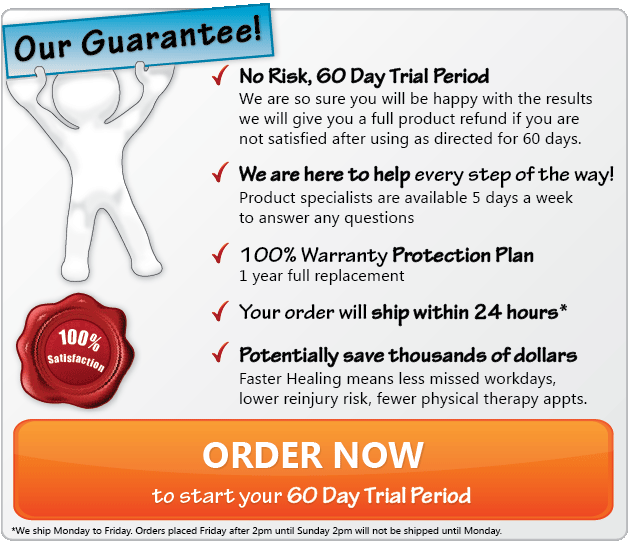 The bottom line is, you are welcome to try our products for a full 2 months. If you do not receive the benefits that others have experienced after using the product as directed, simply call us to initiate a return and we will issue a prompt & full refund. There will be no hassle and no hard feelings.